It’s almost the end of January. How is everyone doing on those resolutions? I actually decided to do something different this year and just not make any. Bring on the cookies! Actually, I decided that rather than set specific goals, I would just try to live each day in as healthy a manner as possible. I know… all those diet gurus with their intentions and affirmations would totally disagree, and I’m sure writing down goals works for some, just not for me. And, you know, my definition of “healthy” differs from day-to-day depending on what is going on in my life. Lately it’s been a lot of intense, all-day snow shoveling resulting in ravenous hunger. In that case I think it’s okay for a treat or two. Other days, rather than tackling that plank workout, some restorative yoga may be a better choice. One thing we don’t neglect, however, is our commitment to what we consider a healthy diet. 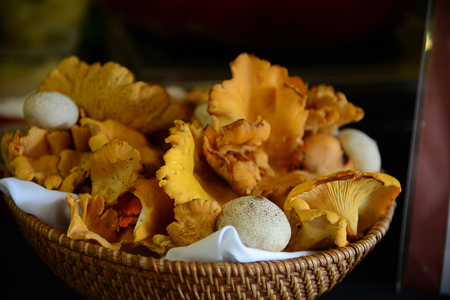 For us that means pretty much no processed food, as much as possible prepared from scratch, and a LOT of vegetables. I’m here to tell you that’s not easy sometimes, especially after a long day at work. I spend a lot of time in the kitchen, and there are days that I just can’t face it. I cook extra so there is always something in the freezer, but sometimes even that is not enough. That’s when we say “oh well,” and pull out the Chinese take out menu or order wings or pizza. The tomatoes in the pizza sauce count as a vegetable, right? Actually, I’m okay with ordering out on occasion, especially if I’ve had my usual huge salad for lunch. One thing that is super easy to make and keep on hand and takes your salad to a whole new level is homemade salad dressing. I use bottled dressing too, but much prefer to make my own, when I remember to do so. I usually have a vinaigrette of some type in the fridge as well as a creamy mayonnaise and buttermilk based one. I’ve decided to start doing a section on Jeannine’s Cuisine called Kitchen Basics. These will be recipes that everyone should have in their hip pocket. These are foods that are the building blocks of how I cook. Vinaigrette seemed like the ideal choice for the first one. The proper ratio for a vinaigrette is three parts oil to one part acid. For one cup that means 3/4 cup of oil to 1/4 cup of vinegar, lemon juice, etc. I have seen countless salad dressing recipes that call for half oil and half acid. 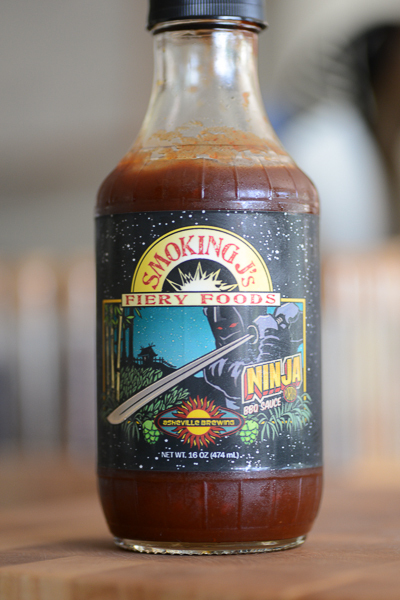 In some cases, when someone is trying to produce a low fat salad dressing, the ratio is even switched – pucker up! Just don’t go there. I almost always add a teaspoon of Dijon mustard for flavor and to help with emulsifying, and then I add herbs and other extra flavors. For this recipe I decided to go with strictly dried herbs. That might have something to do with the fact that my fresh herb garden is currently buried under about 3 feet of snow, but I also wanted to see how it would taste. I was pleasantly surprised, and I think you will be too. 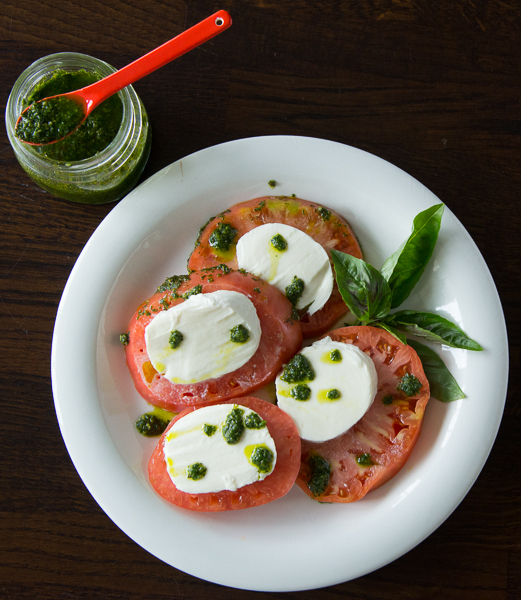 The amount of dressing will depend on if you use dried or fresh herbs, or even a combination. I generally allow one teaspoon of dried herbs for a tablespoon of freshly chopped herbs. The red pepper flakes add a bit of a bite and some nice color to this dressing. Feel free to decrease the amount or leave them out. Combine all ingredients in a 1 1/2-2 cup mason jar and screw on the lid tightly. Shake the jar vigorously to blend the ingredients. 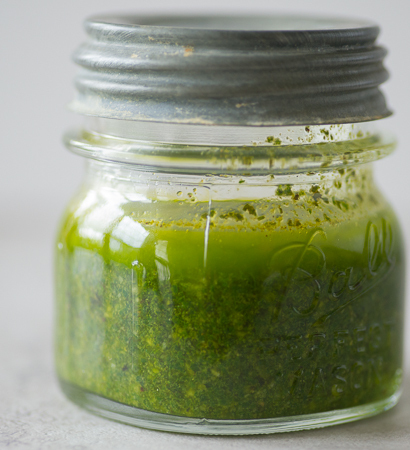 If using dried herbs allow the dressing to sit for 15 minutes and shake again. Note: You will have to shake the dressing to blend it each time you want to use it. Alternatively you can place the acids and the mustard in a bowl and whisk in the olive oil a bit at a time before adding the remaining ingredients. This will better emulsify the dressing and prevent it from separating as quickly; however, it does take more time. Can you believe Thanksgiving is here already? I shudder to think of how little time remains before Christmas. I tend to get so overwhelmed with stuff to do I end up not doing anything. Or, I jump from task to task and never finish anything. Not a great way to get things done. So, I’m trying the “three big rocks” method of time management…pick three things and don’t do anything else until you get those three things done. It sounds great on paper, doesn’t it? This is the time of year that I really want to take the time to enjoy. I want to sit in front of that fire and read a book, or get outside and enjoy the fall crispness in the air. Experiment with some ingredients I don’t always cook with. 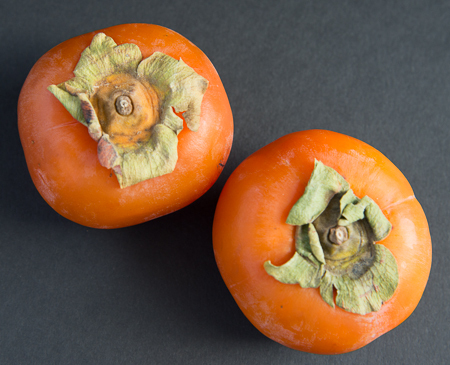 Persimmons are one of those beautiful fall fruits that I’m always telling myself I should play around with, but never seem to get around to. I’m not a fan of eating them by themselves, but when I saw this recipe I had to try it. I had a bag of Meyer lemons in the fridge and loved the idea of a side salad that was more than our usual Romaine lettuce and vinaigrette. For those of you still looking to add one more side dish to the Thanksgiving table, this salad is it. 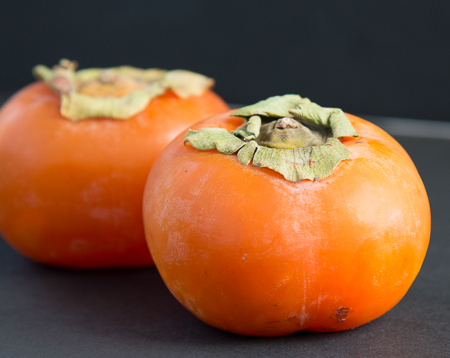 Healthy, but definitely not boring – slightly bitter greens are paired with sweet persimmons, zinged with some Meyer lemon, and finally given a note of decadence with some creamy Stilton cheese. 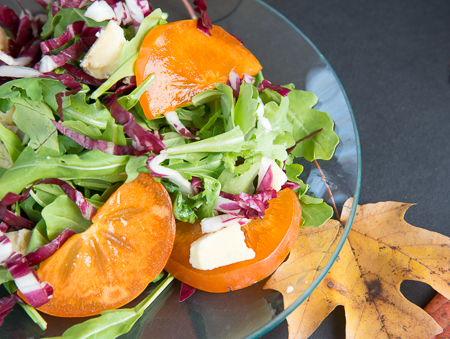 The variety of flavors in this salad will go with any fall meal. And it’s incredibly easy and fast to make. 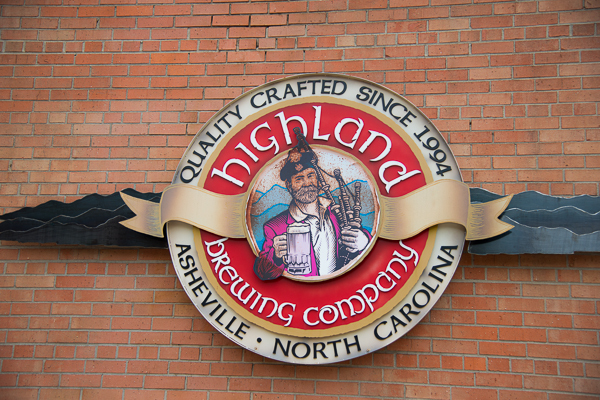 That’s a win win for the busy holiday season. If you can’t find Meyer lemons, regular lemons will work just fine. Meyer lemons are sweeter, so if you use regular lemons add an additional half a tablespoon or so of honey to the dressing. 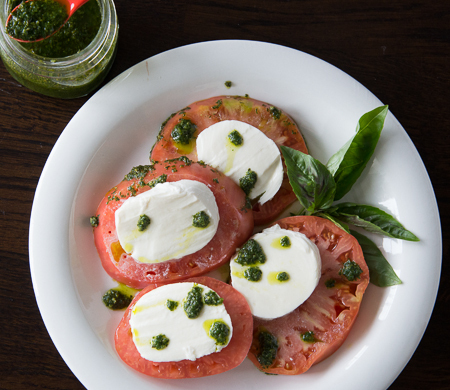 This salad is best served right after making it. 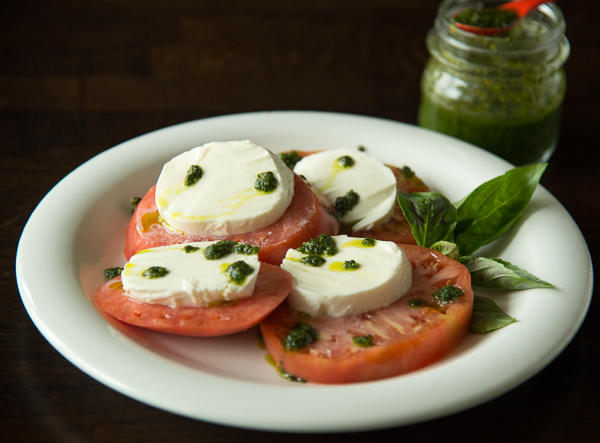 But if you want to prepare it ahead, make the dressing separately and dress the salad right before serving. 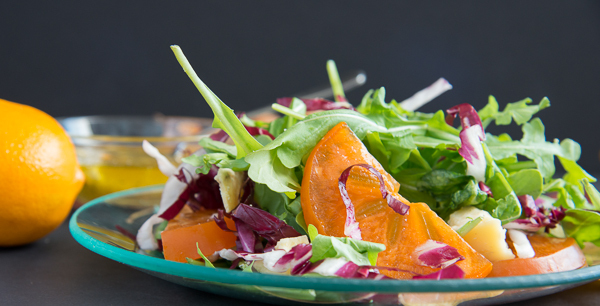 Whisk the olive oil, diced lemon, honey, lemon juice, salt, and pepper in a large bowl you intend to serve the salad in. 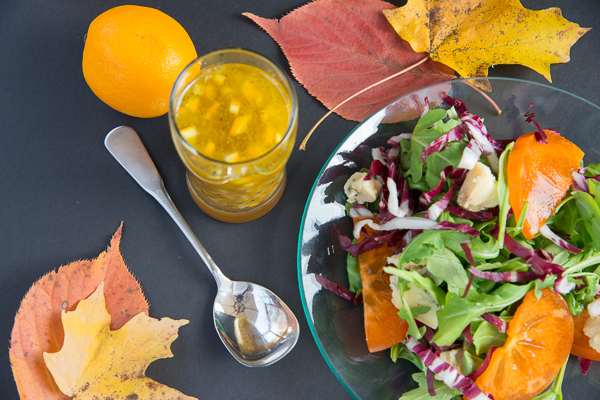 Add the radicchio, arugula, and persimmons and toss with the dressing. 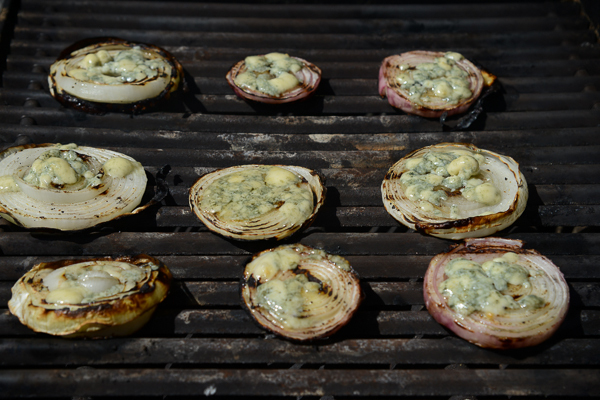 Divide the salad among four plates and top with the Stilton. Now that Memorial Day is a couple of weeks behind us, it’s “officially” summer, even if the solstice is still 2 weeks away. I know this because I just popped the first bright yellow cherry tomato off one of the tomato plants and ate it right there in the garden with the sun beating down. Mmmmm! I love taking a bowl of them to work to have with my lunch. Such a nice change from our usual green salad. Eating that cherry tomato is actually how I discovered that I accidentally bought two cherry tomato plants rather than a cherry and a big tomato plant, as I had intended. Ooops! That’s okay. It was an excuse to go buy another tomato plant and a few corn plants as well. Now I have an even bigger “farm” than I did before and, more important, even more tomatoes this summer. So I go a little nuts with the summer veggies. My next-door neighbor saw me as I was carrying the box of plants to the garden and exclaimed…”more plants, Jeannine? Is that CORN? Big corn or little corn?” Truth be told, I didn’t know there was a difference. I guess I’ll find out. And I’m still laughing about the incredulous look on his face. Hmmm, I guess it’s like the cookbook thing. I may have a veggie problem. 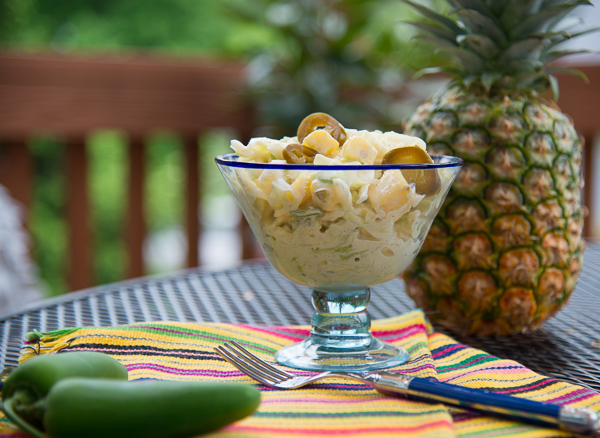 This salad is ideal for the warm, humid days of summer. Other than a few items during the holidays, I don’t have a lot of go-to recipes that I make all the time. My husband often jokes about my “5-year rotation” on recipes. This salad is the exception. I first prepared it many years ago while living in Athens, Greece. I served it at a Memorial Day picnic I had at my house and it was a huge hit. Sour cream was totally unavailable in Athens, but Greek yogurt made a great substitute, and I’ve used it ever since. 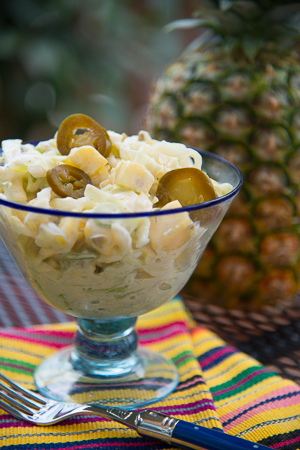 The jalapeño in this recipe does not make this salad fiery hot, rather it adds a nice spiciness. Feel free to adjust up if you like a little more heat, or even leave it out. The salad can be made 1 day ahead. Whisk the mayonnaise, yogurt, mustard, sugar, lemon juice, salt and pepper in a large bowl. 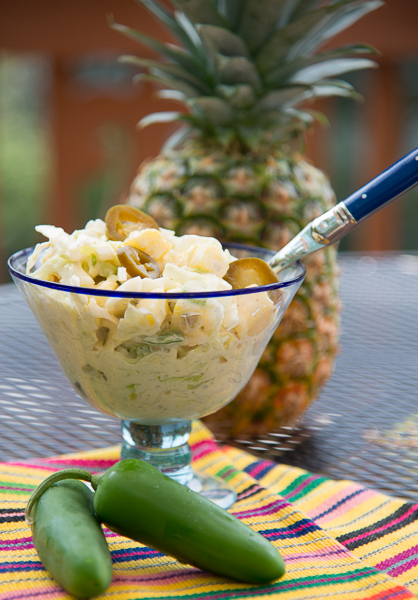 Stir in the chiles, then add the cabbage and pineapple and toss to combine. Cover and refrigerate for 1 hour. Right before serving, stir in the green onions and adjust the seasoning if necessary. I’ve been doing a lot of thinking about the direction I want to take this blog. Is it all about the photography? Food styling? Or is it about developing original recipes? I started the blog not only as a way to reach out to friends and family when they requested a recipe, but also as a way to work on my food photography, with the possibility of turning it into something more professional in the future. I didn’t realize just how much time it takes to post a decent blog post, but I’m not willing to cut corners. 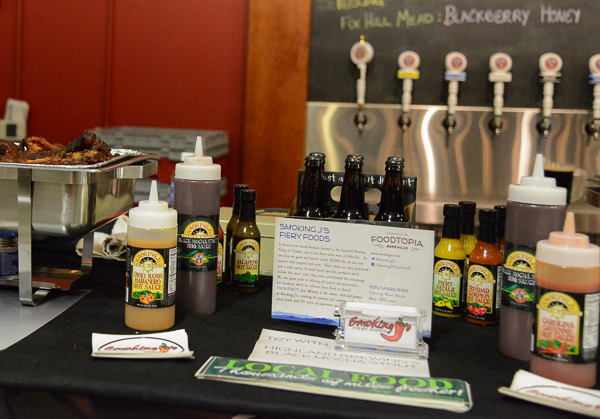 Don’t worry, Jeannine’s Cuisine is not going anywhere — not after all the work I’ve put into it. But I’ve finally accepted that, as a full-time Government employee with up to 2 hours of commuting each day, sometimes I’m just not going to be able to post as often as I would like. I read about other bloggers who also work fulltime and have been doing this for years. How can they be so prolific? Where do they find the time? As for me, I’m still working out my “blogging routine.” I guess I’ll get it down eventually, but in the meantime, I will continue to post as time allows. I’ve also thought a lot about my food message. Is it gluten free? Paleo? Desserts? Quick and easy? Original recipes or adapted from other sources? I think I made the right decision when I decided to name this blog Jeannine’s Cuisine, because the food style in my blog is about all of those things. It’s the way I like to cook. Sometimes the food is healthier and at other times the food I cook is better suited to a special occasion, or when I have all kinds of time to cook. What you won’t find here is any processed food or anything labeled “fat free.” I generally change pretty much every recipe I get my hands on to some degree, and occasionally I even get an original idea and just roll with it. But I also use my ever-expanding cookbook collection for inspiration quite a bit. My goal for the future is to expand the collection of recipes on the blog, both original and adapted, to offer something for everyone. Because that’s the way I cook. Yesterday was Cinco de Mayo, and food bloggers everywhere were hard at work, coming up with all kinds of delectable Mexican-style appetizers, entrees, and desserts. I would usually have done the same, but this year, after returning from non-stop gorging on Mexican food during a week-long trip to Arizona, Yum! I decided something a little healthier was probably in order. I take a salad to work for lunch most days of the week, and it’s normally a bowl of lettuce with some salad dressing. I’m starting to get pretty bored with that and have been experimenting with making the lunchtime salads a whole lot more interesting. This salad is the answer. 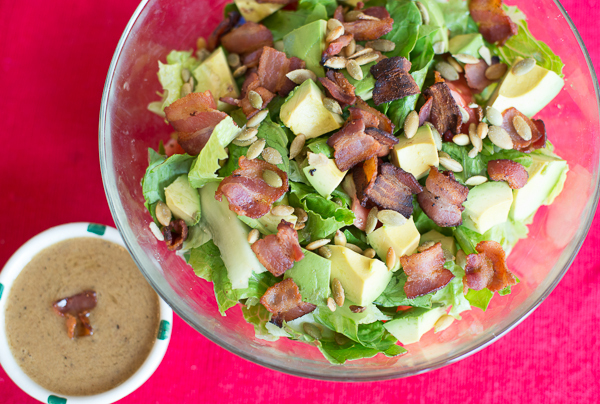 A delicious bacon vinaigrette (who doesn’t love bacon?) 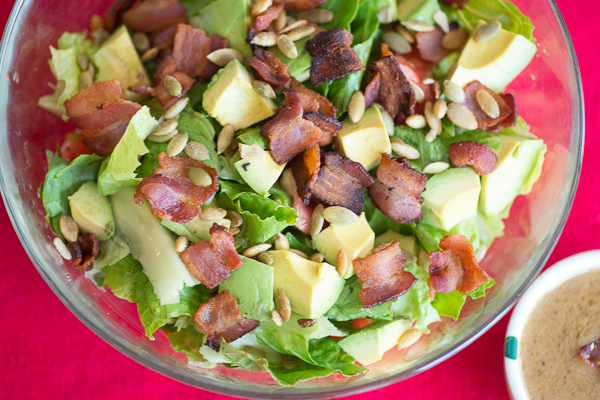 goes over a mixture of salad greens, tomato, avocado, bacon “chips” and toasted pumpkin seeds. 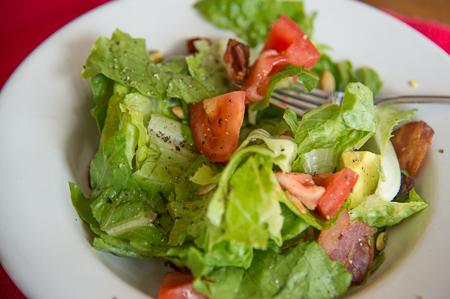 I was trying to come up with something for Cinco de Mayo – this salad contains avocado and pepitas that are sort of Mexican ingredients, right? 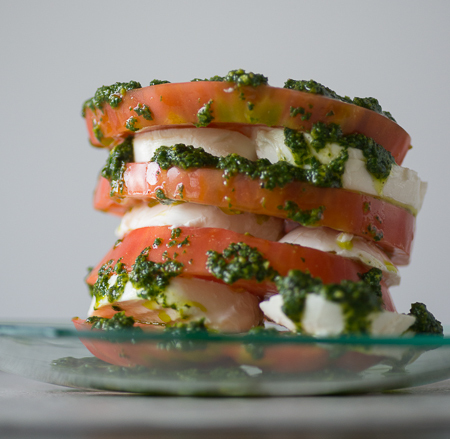 Don’t limit yourself to May for this salad. This is good anytime of the year. 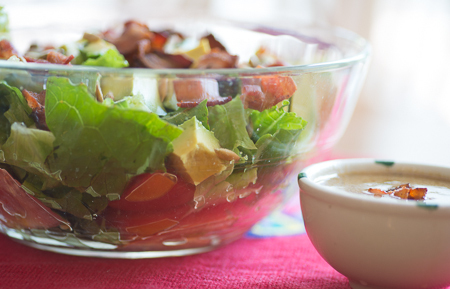 This recipe makes more salad dressing than you will need for the salad. Store leftovers in the refrigerator and warm to room temperature before serving. Place the onion, mustard, and vinegar in a small bowl and whisk to combine. Slowly add the olive oil a small bit at a time, whisking with each addition. Add salt and pepper to taste. Place the bacon in a cold sauté pan and turn the heat on medium. Cook the bacon until crispy then turn it out onto a paper towel-lined plate. Set the pan with the bacon grease aside while you prepare the salad. 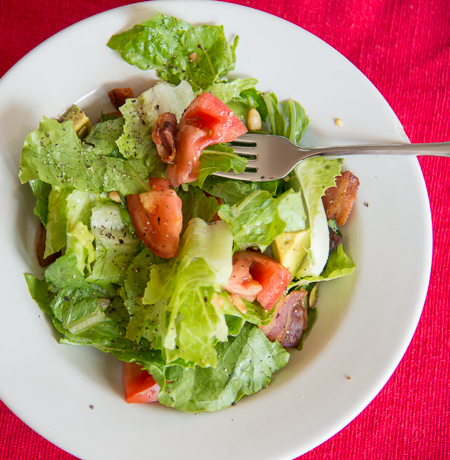 Combine the lettuce, tomato and avocado in a serving bowl. Add the vinaigrette mixture to the bacon fat in the sauté pan and whisk well to combine. The mixture may splatter if the bacon fat is still hot. Dress the salad with as much dressing as desired, top with the cooked bacon pieces, sprinkle with the pumpkin seeds, and serve immediately. Snow day! 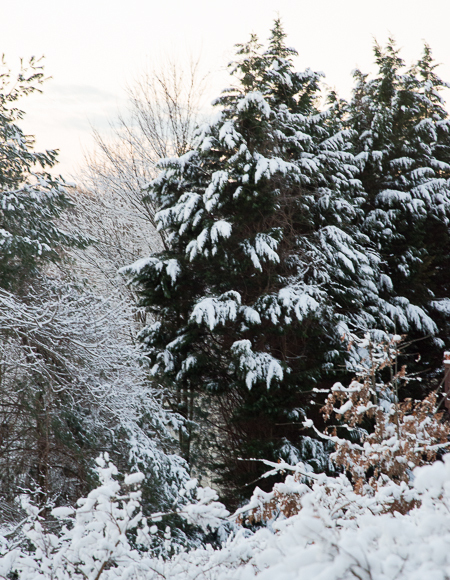 We don’t get too much snow here in Northern Virginia, so, when it does snow, it’s an event. 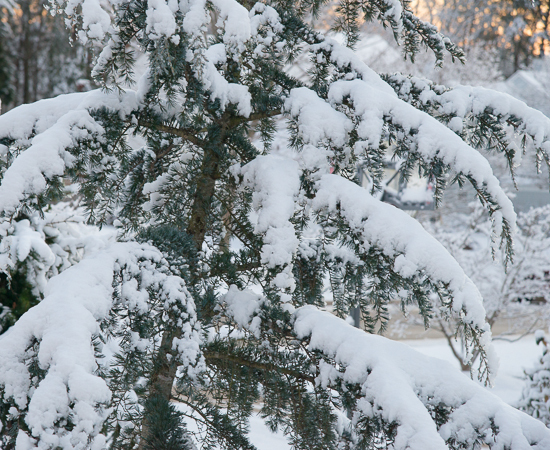 It started late yesterday afternoon, and, okay, it’s only an inch or so, but it’s snow! When I got up at 4 a.m. to go to work, it was still snowing, the roads looked horrible, and I knew there was no way I was going to drive in this stuff. Never mind that I used to drive in much worse in Germany. Ahh, what good pair of snow tires will do for your car. Anyway, I had two choices, ride to work with my husband or take the day off. Hmmm, what to do? I grabbed my camera, went outside and started taking pictures. The sun was just starting to come up, and the light was beautiful. I stay pretty busy, and don’t often just stop and look at the beauty around me. I did that this morning and realized I need to do a lot more of it. Snow on the ground signifies that I can continue the Christmas season just a little longer. 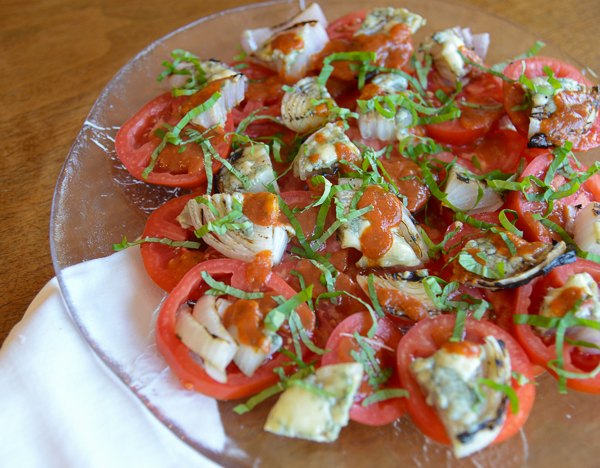 The recipe I’m sharing today is a beautiful salad I made for Christmas Eve. I loved it so much I made it again for New Year’s. The colors, red pomegranate, green arugula, and white goat cheese, make it perfect for Christmas, but don’t limit yourself to just making it for Christmas. 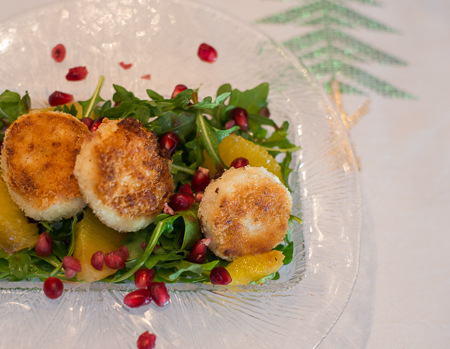 Goat cheese salad, a French favorite of mine, is great any time. 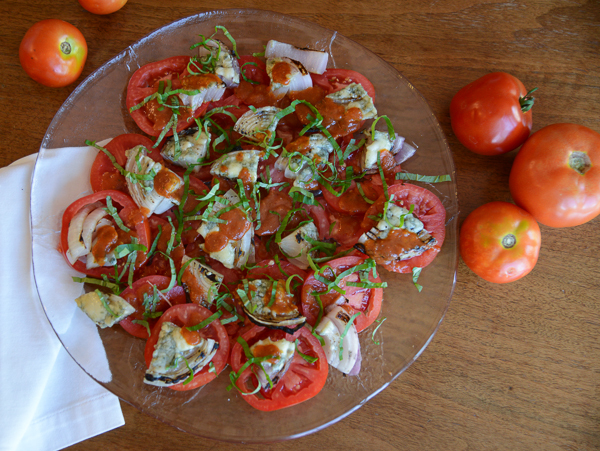 And you could easily mix it up by adding or substituting ingredients, such as using frisee with a Dijon vinaigrette. However, don’t skip the goat cheese. 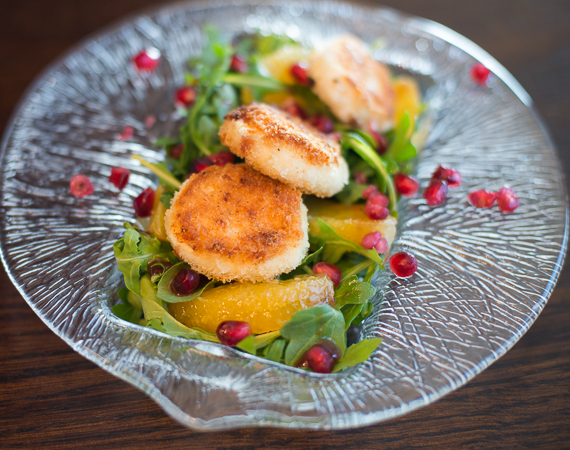 Breaking into the crispy exterior of the cheese to the soft melty interior is what makes this salad. This recipe can easily be doubled. It can be made gluten free by using gluten-free flour and panko. The best way I have found to cut goat cheese into smooth slices is to use dental floss. If you don’t have any on hand, a knife dipped in hot water is also helpful. Leftover vinaigrette would be delicious on a spinach salad with bacon. 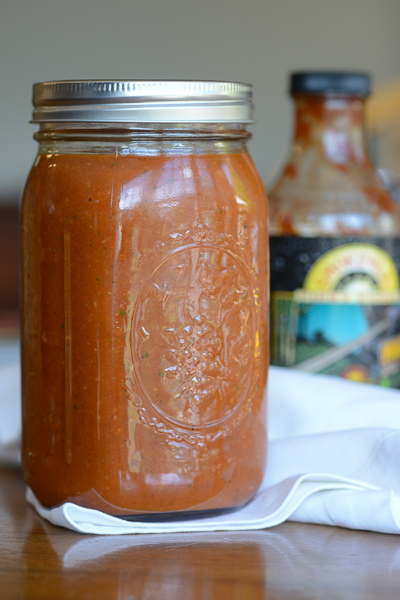 You will need to allow the vinaigrette to warm up to room temperature before using. Prepare the vinaigrette. Bring the pomegranate juice to a boil in a medium saucepan. Reduce the heat to medium and cook until the juice is reduced to about 1/4 cup, about 15 minutes. Transfer to a bowl and allow to cool, about 30 minutes. Whisk in remaining vinaigrette ingredients and set aside. If using a whole pomegranate, remove the seeds. I have found the best way to do this is to cut the fruit into chunks and use my fingers to remove the seeds in a bowl of water. The seeds float to the top and the fibrous fruit chunks sink. Place the seeds in a bowl and set aside. Slice each log of goat cheese into 6 slices. Set up a 3–station breading area by place flour and pepper in a shallow dish, the egg whites and 2 tablespoons water in a second dish, and the panko in a third dish. Dredge the goat cheese rounds in the flour, thoroughly wet them by dipping in the egg white mixture then thoroughly dredge them in the panko. Arrange on an aluminum foil–covered plate or pan, cover, and chill for at least 30 minutes. Heat the olive oil in a non-stick skillet and fry the cheese rounds 2 minutes per side or until lightly browned. Drain on paper towels. 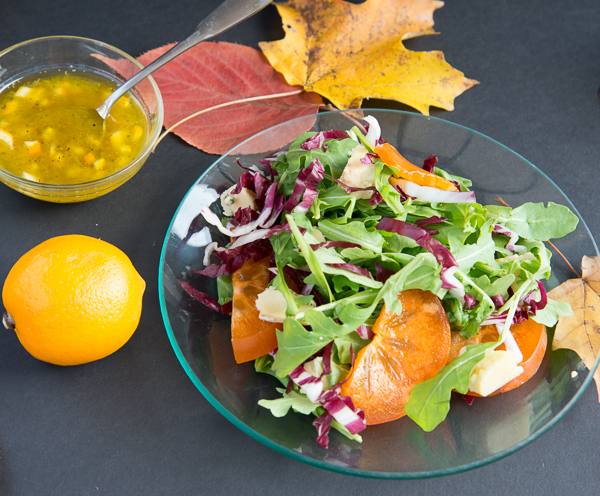 Assemble the salad by dividing the arugula and orange sections between four plates. Drizzle with the pomegranate vinaigrette. 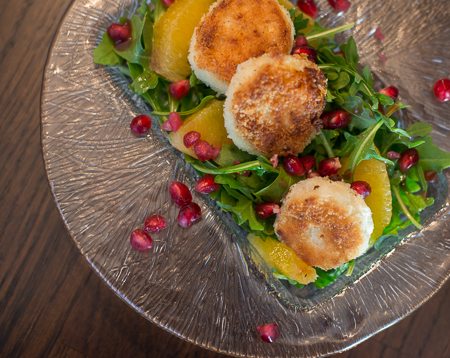 Sprinkle each salad with some of the pomegranate seeds, then top each with three cheese rounds. Serve immediately.